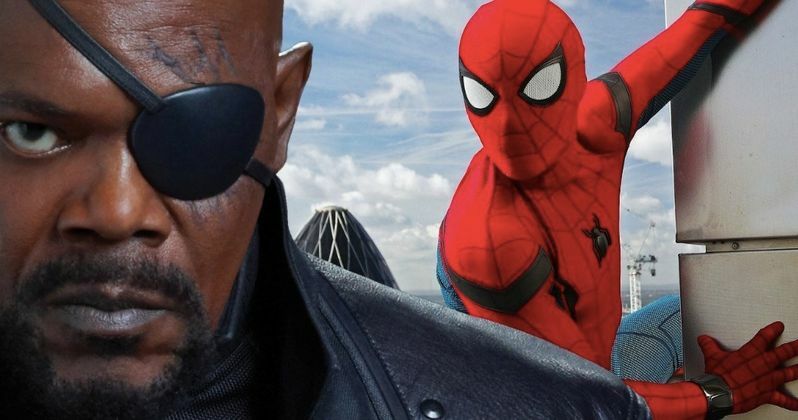 Samuel L. Jackson Teases Nick Fury's Return in Spider-Man: Far from Home? Samuel L. Jackson plays a huge role in next March's Captain Marvel. He's billed as the second lead behind Brie Larson, and will be reprising his role as S.H.I.E.L.D. agent Nick Fury. Only this time, he'll be decades younger and he'll still have both eyes intact. Recently, Jackson teased a return to the Old Nick Fury version of the character on Instagram. Is he shooting scenes for Avengers 4? Or is he showing up in Spider-Man: Far from Home? Captain Marvel wrapped shooting last Friday, just as the latest Marvel adventure, Ant-Man and the Wasp, opened in theaters. Now, Samuel L. Jackson is showing off some props which hint that old Nick Fury is back in business. But how or where is anyone's guess at the moment. Samuel L. Jackson begins his Instargram slideshow with a look at Nick Fury's business card. And right there under his name it says 'Bad MotherF***er'. We also learn his phone number and address. We're not sure what's at that address, but if you call that number you'll just get a disconnected dial tone. So don't get too excited. We probably won't see this card shown on screen unless its blink-and-miss. Fury almost got away with saying the F word in Infinity War before Thanos' snap turned him to dust. It was reported earlier in the month that Nick Fury will be staying young throughout the entire duration of Captain Marvel. He'll have to be de-aged, which required the actor to wear dots on his face for the entire shoot. In the second slideshow image, we get to see Nick Fury's old man beard and mustache wig, which is a little creepy. But, having gone clean shaven in Captain Marvel, and with the movie just wrapping, the actor probably didn't have time to grow it all back out. Samuel L. Jackson says this in the post. "Back to the familiar, the comfortable, the lovably fierce! Loving today's mood!" The third image shows off the three scar prosthetics that run across Nick Fury's left eye.The final image is of Nick Fury's eyepatch. And when Jackson says he's getting back to the familiar and comfortable, he most likely is referring to this. It looks like old Nick Fury is back in business. If we were betting on where we'll see him next, our guess would be Spider-Man: Far from Home, since it just started shooting. While the Russo brothers have been quite active on social media lately, we haven't heard about any Avengers 4 reshoots. Unless Jackson is shooting that movie's post-credit scene. Which doesn't quite sound right, does it. You can check out Sam Jackson's Instagram photos here.